Weather-permitting, it is not uncommon to see a young man selling books outside of the Nâzım Hikmet Cultural Center in Ankara. As in many places in Turkey, the wares are carefully assembled on a repurposed aquamarine* bed sheet and laid out on the sidewalk for passers-by to politely ignore while the peddler busies himself with something else—in this case, reading. On one particular late-May afternoon, I happened across this man after a perplexing transaction with an unctuous electronics salesman and a relatively gratifying transaction with a tobacconist. The point being, I was in a good enough mood to stop and look. I’d always found these displays somewhat romantic, yet crude. So while interested, I didn’t want to be seen patronizing the odd practice. I would rarely stop to look. As usual, the books were mainly either beyond my linguistic abilities of comprehension or counter to my sense of propriety. One, however—an older, water-damaged paperback—caught my attention. It was a compilation, a volume of the collected newspaper articles and columns of the late Peyami Safa, journalist and novelist extraordinaire. An unusual find. After several more minutes of nervous browsing, I picked the book off of the sidewalk for the third and final time, leaving a conspicuous aquamarine gap, like a missing tooth. The young man looked up from his book only when I approached him with my selection. He asked for three lira. I gave him five—it was worth far more than five lira to me. 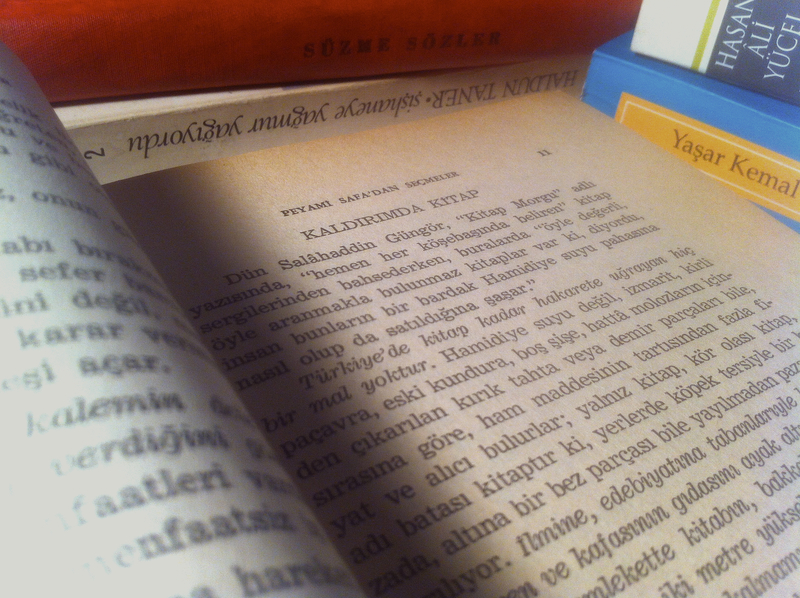 In Turkey, there is nothing that suffers as much indignity as books. Not just Hamidiye water, but cigarette butts, filthy rags, old shoes, empty bottles, and even the broken wood and iron scavenged from rubble will all fetch a higher price than their own raw materials—and more buyers, too. Only books, only those damned, wretched books are placed on the same ground as dog waste and put up for sale without so much as a piece of cloth beneath them. When a country gives the same position to knowledge and literature as it gives to its heels, and places the nourishment of its mind underfoot, that suggests that books have about as much dignity as the brooms in grocers’ shops (at least the brooms are hung one or two meters off the ground). Script both new and old,‡ authors both great and insignificant, works from both east and west, compilations, translations, and every variety of writing, writer, and quality—all underfoot. Fellow-citizen! There is a danger as dreadful as an enemy invasion hidden in this tragedy. Fellow-citizen! Great catastrophes will utterly destroy the progress of any nation where books crawl on the ground. Fellow-citizen! Good, bad, valuable, worthless, compilation, and translation, buy your share of these books! Sell your bedspreads if need be, but buy these books and get them off the ground! *I.e., the color of public pool locker room tiles. No, the peddlers’ bed sheets are not always aquamarine, but when they are, I remember it. †A high-mineral-content water piped from Istanbul’s Belgrade Forest since 1902; apparently a subject of derision for quite some time now. ‡Referring to both Latin and Arabic script, the latter of which was officially canned in 1929 and replaced by the modern Turkish language.